NEW YORK/LONDON/BEIJING (Reuters) - Manufacturing in Asia and Europe finished the first quarter on a weaker note but activity in the United States remained relatively steady, suggesting severe winter weather in North America had only a modest effect on U.S. factories. Factories across Europe eased back on the throttle in March while China's vast manufacturing industry contracted for a third straight month, surveys showed, fueling expectations policymakers may be forced to act in coming months. The performance in the U.S. contrasts with the lackluster data elsewhere and arguably gives U.S. monetary authorities more room to reduce stimulus than their central banking counterparts abroad, who are trying to prop up growth. U.S. markets judged the news as positive. Stocks added to gains to push the S&P 500 to a new intraday record, and the dollar edged higher. "It is consistent with an economy making progress but one growing between 2 and 2.5 percent," said Richard Franulovich, senior currency strategist at Westpac Banking Corp in New York. "That's respectable but not as much as the Fed would like." The two U.S. surveys, one from Markit and one from the Institute for Supply Management, contradicted each other in spots, but both overall figures were solidly above 50, indicating ongoing growth. The weak performance of China's massive manufacturing sector remains a primary concern for the global economy. The final Markit/HSBC PMI gauge of factory activity fell to an eight-month low of 48.0 in March, and has remained below the 50 level since January. The official survey, which is geared towards bigger, state-owned firms, showed a marginal increase to 50.3 from 50.2, but economists warned that given seasonal patterns it too could be taken as a sign of weakness rather than improvement in the world's second-biggest economy. 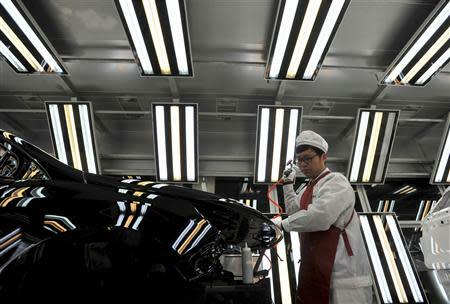 "Overall, both March PMI readings further underpin the weak start to the year experienced by the Chinese economy. They also increase the pressure on the Chinese authorities to stimulate the economy," said Nikolaus Keis, an economist at UniCredit. Investors are betting China will try to arrest the loss of momentum after what has shaped up to be its worst quarter in five years. Last week, Premier Li Keqiang said Beijing had the necessary policies in place and would push ahead with infrastructure investment, after recent weak economic data and mounting signs of financial risks clouded the nation's outlook. "The PMIs have given a steer on the Chinese economy for a while and it is looking like the People's Bank of China will take some action," said Philip Shaw at Investec. Markit's final reading on U.S. factory growth in March fell to 55.5 from 57.1 in February, while ISM's survey rose to 53.7 in March from 53.2 in February. Markit noted a slight dip in new orders and output growth, while ISM said its new orders subindex rose marginally. More concerning was the drop in the ISM employment subindex to 51.1, the weakest since June 2013, from 52.3. Other markets across the Americas posted improved figures. The pace of growth in Canada picked up in March thanks to rising new orders, with the RBC Canadian Manufacturing PMI rising to 53.3 from 52.9 in February. Brazil's manufacturing activity expanded for the fourth straight month in March, with the HSBC PMI rising to 50.6 in March from 50.4 in February, even as new order growth slowed. Output again rose across the board in the euro zone, suggesting its recovery is becoming entrenched, but Markit's Purchasing Managers' Index (PMI) also revealed that factories were once more cutting prices. The bloc's final manufacturing PMI came in at 53.0, matching an earlier flash reading but below February's 53.2, while the output price sub-index dropped below the 50 mark that separates growth from contraction for the first time since August. Euro zone inflation fell to just 0.5 percent last month, its lowest since November 2009 and well below the European Central Bank's target of just below 2 percent. The ECB is expected to keep monetary policy unchanged on Thursday despite calls for it to act to support growth. Olli Rehn, the EU's top economic official, added to that pressure on Tuesday, saying prolonged low inflation would make it harder to correct imbalances in the euro zone. Growth in British manufacturing unexpectedly eased to its slowest pace in eight months and prices paid by factories tumbled, giving the Bank of England scant reason to adjust its loose policy stance. In Japan, the closely watched central bank tankan survey showed business sentiment barely improved in the three months to March and was set to sour this quarter following an increase in sales tax that took effect on Tuesday. The tax hike was put in place to shore up government revenues and help lift Japan out of years of deflationary stagnation. Big manufacturers and non-manufacturers in Japan expect conditions to worsen in the three months ahead, keeping alive expectations the Bank of Japan will boost its massive monetary stimulus to sustain recovery in the world's No. 3 economy. Japan's Markit/JMMA Manufacturing PMI pulled back further from January's eight-year high as heavy snow in some areas curbed production. Factory PMI surveys for Asia's third and fifth-largest economies India and Indonesia also came in softer, with India's index still in growth territory, but Indonesia's hitting a seven-month low. However, South Korea, Asia's fourth-largest economy and one of its leading manufacturing and export powerhouses, managed to buck the trend as its HSBC/Markit manufacturing gauge rose.